The Gaming Tailgate - Join the 2018 TGT College Pick 'Em group on ESPN.com! The group is free to play, so feel free to invite friends and family. Continue on to read full details on how to join. Here's how the game works: Every week throughout the college football season, we select 10 evenly matched games. It's then up to you to do your research (or go with your gut) and select the winners of these games while also ranking them from 1-10 based on your confidence level. For example, if you correctly pick the winner of your most confident game, you receive 10 points. On the other hand, winning the game you feel least confident about is only worth one point. Any time you lose a game, no points are awarded - so be careful which ones you declare as your most confident. Good luck on all your picks this fall. The winner (who must be in good standing at TGT to claim their prize) will receive their choice a free game, MSRP of $60 or less. It is free to enter, so feel welcome to invite family and friends. 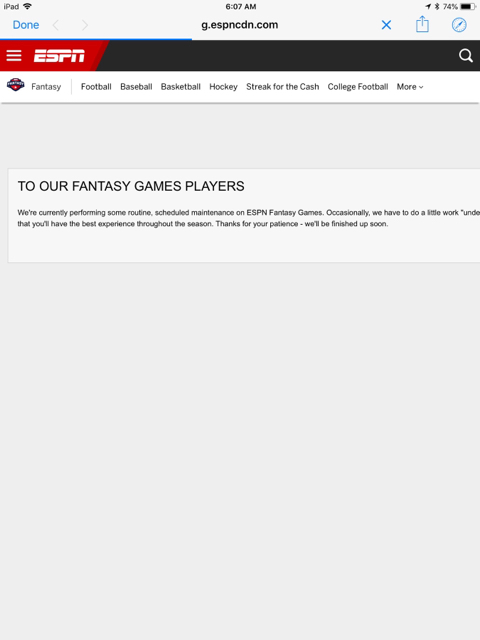 We're currently performing some routine, scheduled maintenance on ESPN Fantasy Games. Occasionally, we have to do a little work "under the hood" to ensure that you'll have the best experience throughout the season. Thanks for your patience - we'll be finished up soon. Still? I went to do mine Wednesday and got that same message. I just tried again. Still getting that stupid maintenance message. While the website is a piece of crap, I was able to just get in through the ESPN Fantasy app. It let me create an entry and make my picks. So if you have the app or can download it real fast, you can still do picks this week, since the ESPN Fantasy website is apparently under never ending maintenance. If possible I'd prefer $60 PSN credit as I'd like to use it to purchase several smaller titles. You’re too good at this! Congrats! Got it, man! Congrats on another win!